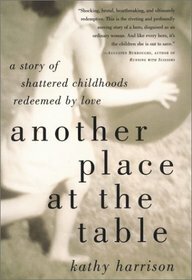 « 52 Weeks of Giving – Weeks 24 – Donate Books to "Books For Africa"
For the 25th week in the 52 Books in 52 Weeks challenge, I’m reading Another Place at the Table – A Story of Shattered Childhoods Redeemed by Love by Kathy Harrison. Kathy’s Harrison’s memoir of her life as a foster parent to over one hundred children for more than a decade is at times sad, heart-wrenching, and (thankfully) funny. It provides a very real picture of the foster care system and some of the children in it. Harrison is an ordinary woman doing heroic work. She is honest about her own failures and weaknesses, about the difficulty in fostering troubled children, about the shortcomings of the foster care system, and about the tremendous need each child in that system has for a loving, attentive family. The children who came to her were the offspring of addicts and prostitutes; the daughters and sons of abusers; and teenage parents who cannot handle parenthood. This book is definitely not “light” or “easy” reading. It is, however, an inspiring book about the life of Kathy Harrison and the incredible impact she has made on the lives of children so desperately needing a parent and family who wanted to care for them.